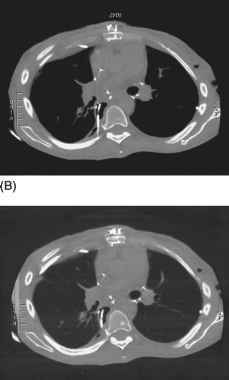 Figure 9 A 29-year-old man with small residual airspace after undergoing bilateral lung transplantation. (A-C) Images after CT fluoroscopic placement images show the catheter in the right paraspinal airspace. Airspace subsequently resolved. num this technique is limited because of the overlap of structures produced by the two-dimensional fluoroscopic display. In many instances, therefore, the enlarged mediastinal lymph node is not distinguishable using conventional fluoroscopy. The inability of fluoroscopy to provide adequate visualization of the target lymph node has hindered wider use of TBNA in the mediastinum. Moreover, it has fueled the perception that TBNA is difficult and potentially dangerous and should be performed only by expert bronchoscopists. Most series have indicated that the technique is inferior to that of comparable surgical procedures, with sensitivity ranging from 37 to 90% [29,30]. Thus, many patients who might be candidates for bronchoscopically directed TBNA are referred for surgery. Ultrasound can be used to guide mediastinal TBNA but is limited by the variable image quality and the need for a bronchoscopist with substantial training in ultrasound . Standard CT can also provide image guidance for TBNA . In a study by Rong et al. 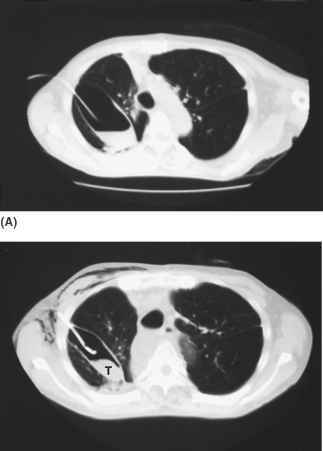 a successful diagnosis was obtained in 60% of cases of mediasti-nal adenopathy that underwent TBNA with standard CT guidance. However, similar to its use for percutaneous needle biopsy, standard CT is cumbersome because of the substantial time delay that occurs while the appropriate slice position is identified, the technologist prescribes the sequence and scans the patient, and image reconstruction occurs. During this period, the position of the bronchoscope must remain stationary for several minutes. This time-consuming sequence of events must be repeated for each adjustment of the bronchoscope. The real-time capability of CT fluoroscopy is valuable in guiding TBNA . Using CT fluoroscopy, each movement of the bronchoscope can be verified quickly on the in-room monitor. The bronchoscopic needle is imaged after it is planted in the airway to assure that it is directed toward the intended biopsy site. Once the needle has been advanced, CT fluoroscopy is used to ascertain that the needle is in the target lesion. Complications such as pneumothorax or hemorrhage are documented quickly. For lung lesions that are approached nonsurgically, the location of the abnormality determines whether percutaneous needle biopsy or TBNA is chosen. Peripheral lesions, especially those that are subpleural in location are most easily sampled using percutaneous needle biopsy. Central lesions, and particularly those in which a bronchus extends into the lesion, are optimally diagnosed using bronchoscopy with TBNA. Large central lesions are diagnosed routinely using bronchoscopy with or without fluoroscopic guidance, particularly if a visible endobronchial com ponent is present. Smaller lesions without an endobronchial component are more challenging and require fluoroscopic guidance, ideally with the assistance of a C-arm. 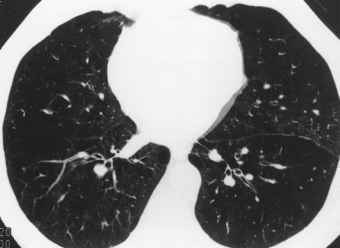 However, conventional fluoroscopy is limited in guiding TBNA if the lung nodule is very small. Moreover, it is often difficult to determine the anteroposterior relationship between the needle tip and the nodule even if biplane fluoroscopy is available. Computed tomographic fluoroscopy combines the advantages of the real-time display of conventional fluoroscopy with a three-dimensional display format such that the bronchoscopist can be confident that the needle is in the lesion.